This is a fern commonly grown indoors, it will however grow outdoors in the right conditions. Grown for the attractive foliage that appears an fine black stems, outdoors it is grown as a shade loving ground cover. Indoors it makes great potted specimen. Despite what you may read, this wonderful little fern will grow outdoors as far south as Melbourne to Tasmania. It is found in all states and it grows widely through the Dandenong ranges along creeks and in damp forested areas. It will go dormant in summer if it receives to much sun and the soil drys, however it will bounce back in autumn given adequate shade and moisture over the hot summer period. Moisture and a humus rich soil are the main requirements. This is a fern that like some humidity, so indoors occasional mist spraying may be beneficial. A better solution is to sit the pots on a saucer full of stones and fill the saucer with water. This will create natural humidity without making the soil water logged. Fertiliser – A liquid seaweed fertiliser every 3 weeks from winter to spring is adequate. Spread – To around 1 metre outdoors. Flower – None, only spores. Suited to coastal conditions – No. 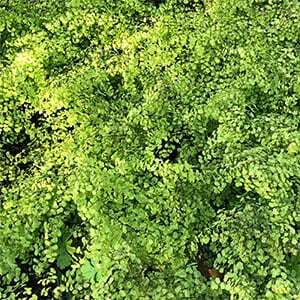 Adiantum aethiopicum is available for sale from the following nurseries.